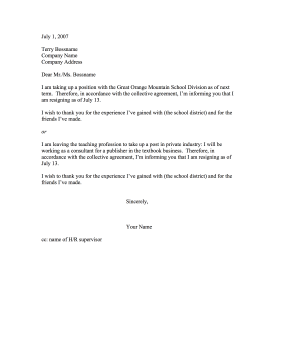 This school district resignation letter is for teachers who have accepted academic positions in other districts. I am taking up a position with the Great Orange Mountain School Division as of next term. Therefore, in accordance with the collective agreement, I'm informing you that I am resigning as of July 13. I wish to thank you for the experience I've gained with (the school district) and for the friends I've made. I am leaving the teaching profession to take up a post in private industry: I will be working as a consultant for a publisher in the textbook business. Therefore, in accordance with the collective agreement, I'm informing you that I am resigning as of July 13.